Ann Stamm Merrell was born in Wauseon, OH on April 29, 1951 and died in Cupertino, CA on March 8, 1999. During her life, she had three primary careers: statistician, musician, and quilt artist. This book documents many of the art quilts that she made, primarily over a ten-year period, for shows, family and friends and for herself. They trace the path that follows both her quilt-making skills as well as her life. It is a tribute to her memory. 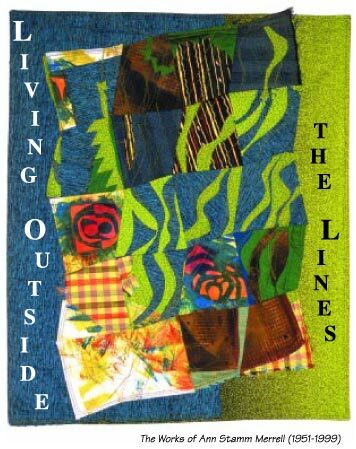 This is the website of the book "Living Outside The Lines." You can order the book here. "I've been making quilts since 1984, when I took my first (and only) hand-piecing class. I used to quilt at people's homes when I was a teen-ager in Ohio. Now I own a lot of fabric and have sacrificed a guest bedroom to have a studio. As a professional musician, I believe that quiltmaking and musicmaking have many similarities - the combining of skill, craft, creativity; the taking of chances; the opportunity to reach a wide audience at many different levels. 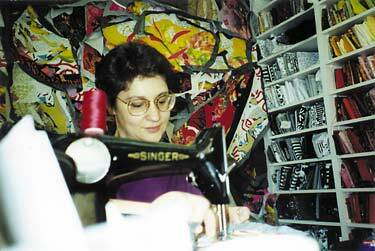 In 1993 I was diagnosed with breast cancer, an event that has affected content, technique, and perspective in my quiltmaking. Much of the content of my quilts now deals with my faith, especially as it relates to cancer. Even in quilts without obvious meaning, the design elements - raw edges, quilting outside the lines, slicing through already finished sections - speak metaphorically of my life post cancer. My technique is driven by the need to have creativity as far into the process as possible, to not try to plan ahead, and to eliminate as much (of what I perceive as) busywork as possible. Also, the physical difficulty of handling large quilt tops has led me to work with smaller units that are completely finished (batted, backed, and quilted) before they are assembled into one large piece. The future: As Artist-in-Residence at Sunnyvale Presbyterian Church, I hope to continue designing large works of visual art, offering diverse creative opportunities, and using my changed perspective as a tool for ministering and being ministered to. As a quiltmaker, I hope to continue developing techniques for maximizing creativity and minimizing physical stress, while exploring new freedoms. Finding time to fit in all my creative vocations is difficult, but setting aside chunks of time totally dedicated to a single pursuit (often away from home) seems to be the best method right now."